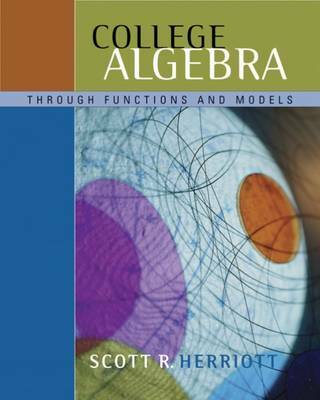 Herriott's COLLEGE ALGEBRA THROUGH FUNCTIONS AND MODELS was developed to meet the needs of students like you who plan to do further coursework in the managerial, social, and health/life sciences. You will sharpen your thinking and analysis skills as you learn to construct models from verbal descriptions and real data. An index of applications illustrates the numerous interesting ways that college algebra is used in the fields of business, psychology, biology, health, human physiology, and sociology. The textbook features Personal Tutor with SMARTHINKING live online tutoring, the Interactive Video Skillbuilder CD-ROM with MathCue, and a Book Companion Web Site with online graphing calculator resources.